Question: What connects Amsterdam, Cork, and Hammersmith? The Irish tricolour, the national flag of Ireland, comprises of three colours – green, white and orange. A flag which carries huge symbolism. The colour Green represents the Catholic and Republican population, and Orange that of the Protestant community. Orange is a colour long associated with the Netherlands through the name of the Royal Family (e.g. William of Orange) and is also worn proudly by the country’s sporting stars. White is one of the constituent colours of the Union Flag and coincidentally happens to be the surname of the author of this report. There must be a connection….. of course – it is chess!! If only the common history of Ireland, the Netherlands and England could have been worked out on the 64 squares, where would we be now? 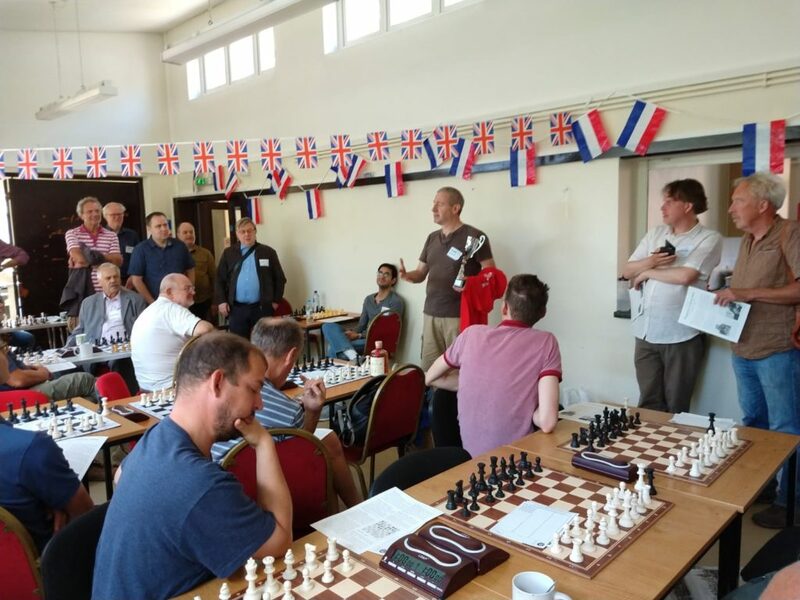 Yes, after enjoying the magnificent generosity of the chess clubs of Espion and Cork, it was Hammer’s turn to play host in a weekend festival of chess. The designated weekend was agreed: the 22nd to 24th of June, and Hammer had to deliver. At this stage the whole of Hammer Chess Club must thank the Hammersmith & Fulham Council, who enthusiastically backed the idea. A typical British meal Saturday evening – it had to be curry! Now last year, in Amsterdam, the Hammer crew were not very cooperative guests and dominated the long-play match, inflicting a heavy defeat – there was also the recent match for the Ring of Cork that had ended in deadlock. The scent of revenge was in the air and the fact that both the Netherlands and Ireland were not at the World Cup weighed heavily (only joking… or not?!?). 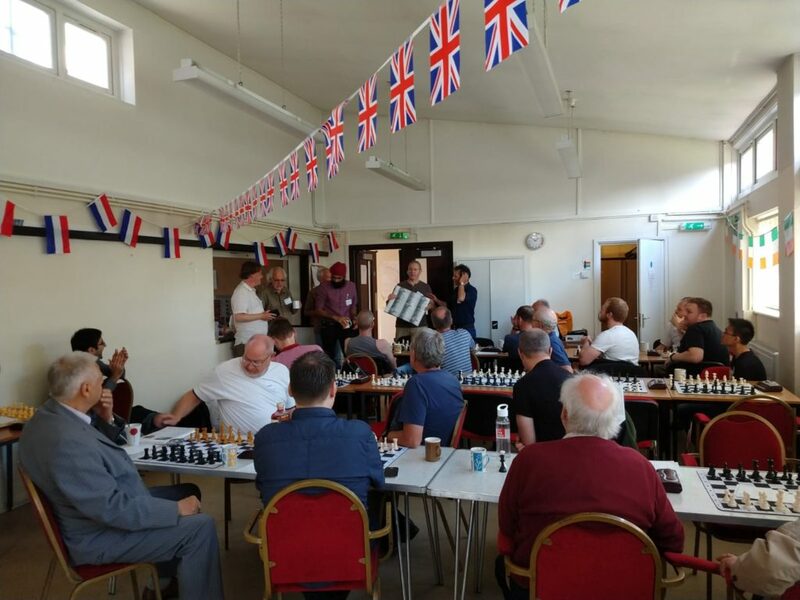 First things first it was so good to catch up with Raymond and the thirteen other Espion boys on the Friday night – it served as a huge reminder of the real friendship between our clubs and the power of chess to break down barriers (are you listening Theresa May??). A bit of blitz was played and we were joined by GM Keith and had a brilliant evening. No thoughts of the deadly combat to follow the next day. We gathered the next morning in the Anvil at the unearthly hour of 9am – snacks and coffee were consumed and everybody got their game-face together. Mark from Cork also joined us in good time. 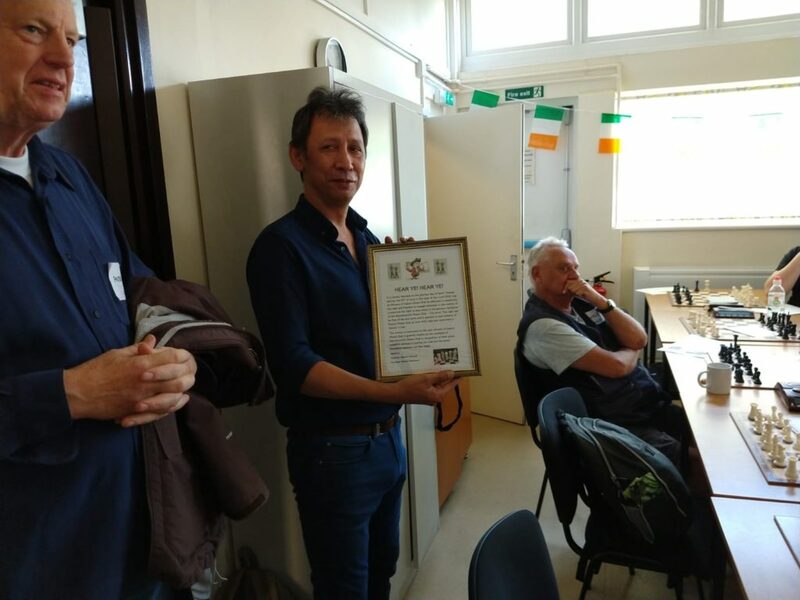 Speeches by Wily, Raymond and Mark were well-received and an exchange of gifts was conducted. Clueless very gratefully accepted a photo-collage of our Amsterdam weekend from Raymond, and Mark brought half of the Ring of Cork and a T-Shirt with a logo proclaiming the “Republic of Cork”. Hammer really needs to invest in a trophy cabinet, methinks. 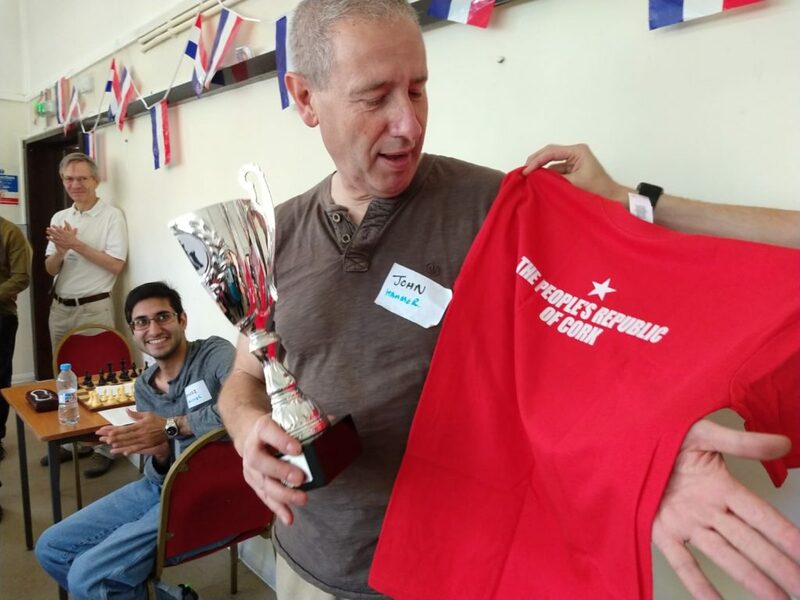 A special edition of the Espion chess magazine – entitled the “Magazine with No Name” was also distributed with a serious quiz challenge with an awesome prize – a bottle of Dutch gin. 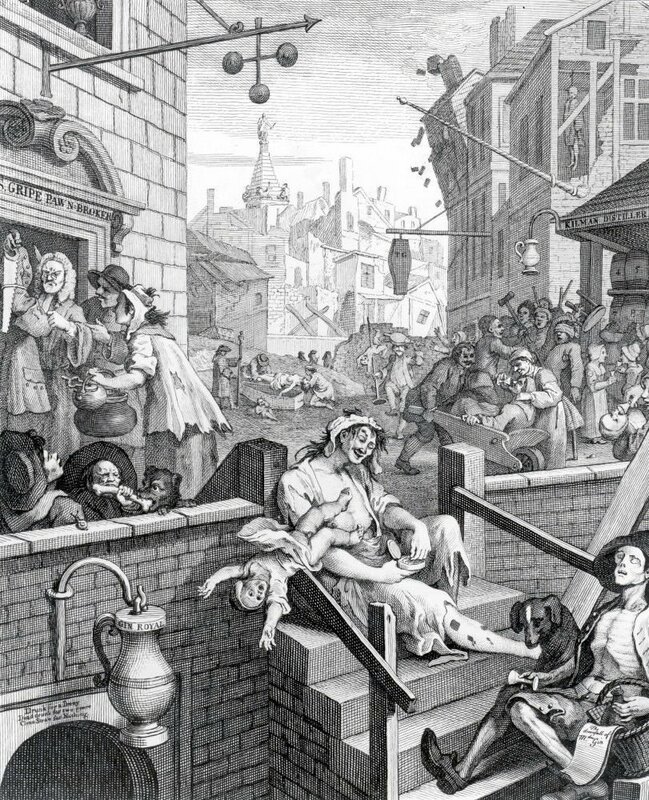 Where would Hogarth and the rest of the English be without the Dutch – a G&T, the absolute definition of an English tipple is, in fact, all down to the Dutch!!! Clueless revealed the Tri-Club trophy that would be the prize for the forthcoming match. Hopefully, this will be contested annually! Finally, we got to the serious chess business. There were two morning events, both run simultaneously. An elite clock simul saw GM Keith take on some of the cream of Hammer – the Great Dane (Carsten), Zeus (Marios), Sydney (Chris S), Brexit (Jeremy) and Alexander (The Future). This was a tough assignment with GM Keith taking on an average of ECF 176 – with only really 20 minutes thinking time at each board. This was a fascinating challenge, which ended with Keith scoring three wins and two losses. He blundered against our Great Dane, and his King endured a long pursuit over an open chessboard. Credit to Keith for keeping it going for so long when many of us would have walked away. He then scored two typical “Arkell-esque” wins with his superb endgame technique as Sydney and Zeus fell to the legend. The Future has real talent and in a spectacular game went so close to causing an upset, however the sheer experience of Keith saw him through. Finally, as in real life, all eyes turned to Brexit. The Hammer version, unlike DD and the rest, gets stuff done – there is no MAY about it, he just carries on – but, as opposed to our miserable politicians – with purpose and fortitude. With time running out and a theoretical win on the board that was a serious endgame study, Keith generously resigned. He then demonstrated the various manoeuvres required to prosecute the win but was so gracious and complimentary of our Jezza’s play. Yep, Brexit had done it… again. The main event saw the pride of Hammer take on the combined might of Espion and Cork. Two vs. one… not bad odds. Pickle was suffering from the mother of the morning-after-the-night-before sydnromes. Clueless was a late substitute when Safi pulled out with 30 minutes to the start. A black cat crossed my path that morning, I walked under several ladders and saw two magpies – the omens were not good – these are all real life alternative facts!! If you believe the hogwash in the last paragraph then you obviously have the gift of Trumpism and believe that fairies are real. The Hammer boys, in the immortal words of a famous Norwegian football commentator, took a bit of a beating. The match card cannot disguise the fact that Hammer were not only Double-Dutched, but were also given a decent chess Mickey Finn. The scoreboard makes painful reading. There were some good individual results with Dead-Eye (Paul K), Sorted (Charlie), Wannabe (Ken) and Vintage (Shiraz) scoring good wins. Clueless did his usual trick of blowing a positional edge with the very rash g4, resigning shortly afterwards… just desperate. 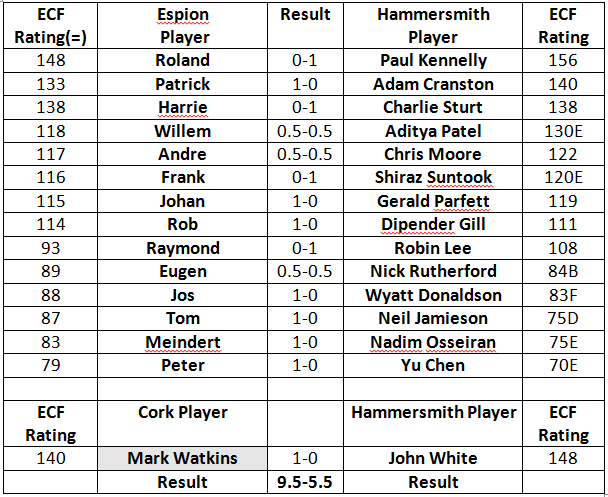 Things were looking even down to Board 10, but then a string of 5 wins took the Espion/Cork boys out of sight. Revenge is definitely a dish best served cold. The worst thing was they are all such nice people and gracious in victory. Raymond, his Espion colleagues and Mark had delivered a lesson that will not be forgotten. Hammer were down but not out. 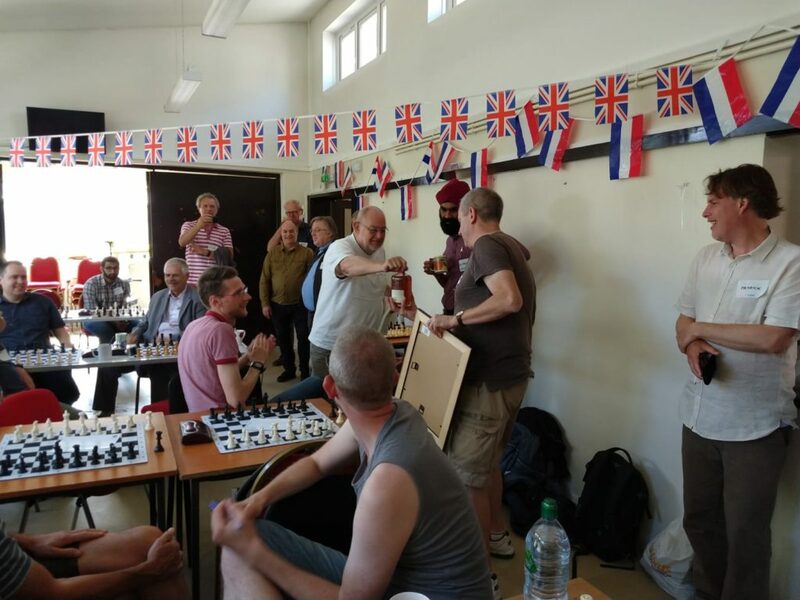 The afternoon session gave a great chance to recapture some dignity with a 34-man Swiss rapid tourney – and GM Keith participating but having a time handicap to even things out. Pickle was at the helm and did a magnificent job. The one thing that can be said is blitz chess runs through the veins of every true Hammerite and the final tale of the tape saw the Hammer boys grab some much-needed dignity back. 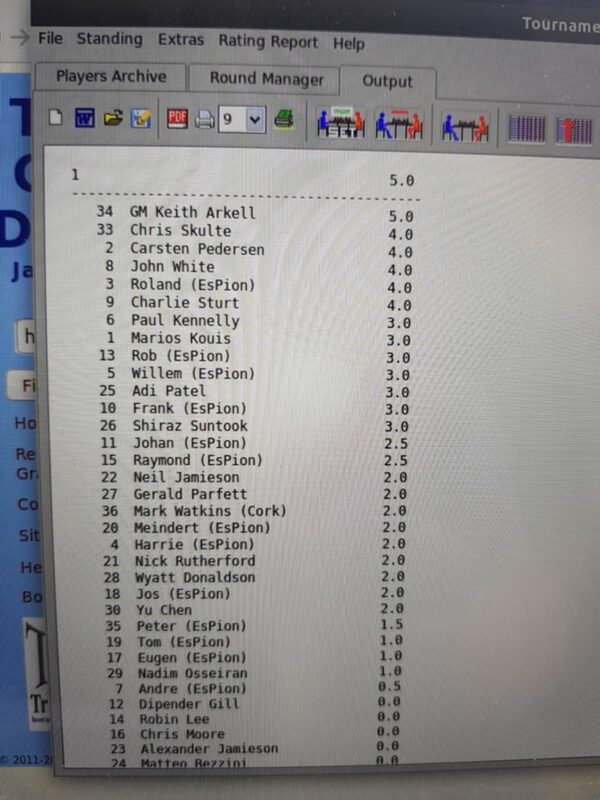 The Legend that is Keith Arkell won despite his time handicap with 6 Hammers and 3 Espion players making up the top 10. This was poor man’s fare for Hammer, but at least heads were lifted and we could exit the Anvil with some pride restored. The next part of the activities involved dividing into teams for the “Magnus Carsten Mastermind” chess quiz at The Albion – with the Great Dane reveling in his ability to find the most obscure questions relating to our brilliant sport. This was great fun and my knowledge of obscure openings and Chess facts was impressively expanded, and that alone was worth it! To say things got feisty would be an understatement – indeed the banter and calling-out reached rarefied levels. The favourites were definitely team Raykell (Raymond’s team had GM Keith) – if you have a GM in your team things have got to go your way! Clueless, in an exercise that would put even FIDE or FIFA to shame, blatantly engineered the result with team Raykell being leap-frogged at the end by Sorted’s band of Merry Men after the aware of the dubious bonus. This was a rigged result but who really cared – it was just huge fun. Around 6pm all departed the Albion and proceeded to the Miram Masala, via Tesco for essential alcohol supplies, where all consumed an excellent buffet and chatted the night away. It was just a perfect example of chess camaraderie. The night ended with friendships renewed, expanded and started – just a brilliant time. The next day started early with Wily, Sorted and Clueless on table/chair transfer duty from the Anvil to Better Gym. The two lads did a sterling job and all was ready for the challenge. Yes, the cream of Amsterdam, Cork and Hammer would be taking on GM Keith “The Legend” Arkell in a 26-board simultaneous. For the amateur players this is a rare chance to take on a GM over the board with a decent change of getting a result. In a superb demonstration of stamina, chess skill and just downright willpower over the course of three hours, Keith won 23, drew 2, and lost 1. The sole winner was Roland who played an outstanding game and scored a thoroughly deserved victory. The answer to the question posed by Espion in the Magazine with No Name – a field in Northern France, Espion and Hammersmith – the point is equi-distant. This signaled the end of the chess weekend and the parting of ways. Clueless signing off, but promising that 2019 will have a tough act to follow, but it will be bigger AND BETTER!!! great stuff, methinks you should change your nickname to Pepys.